We apologize for the delay on the notes , there was lacking on our end but the blog is now up to date and in sha' Allah all future class blogs will be up to date as well. The Prophet (saws) said “May Allah make a person happy who hears something from us and transmits it as he heard it, since perhaps the one whom it reaches comprehends it better than the one who heard it.” [Sahih: Ahmad, at-Tirmidhi and Ibn Hibbaan from Ibn Mas’ud]. “al-Muhaddithul Faasil baynar-Raawee wal Waa’ee” -al-Qaadee Aboo Muhammad al-Hasan ibn ‘Abdir-Rahmaan ar-Raamahurmuzee (d.360H). First book devoted exclusively to the subject. Aboo ‘Abdillaah Muhammad ibn ‘Abdillaah al-Haakim an-Neesaabooree (d.405H). Aboo Bakar Ahmad ibn ‘Alee ibn Thaabit al-Khateeb al-Baghdaadee (d.463H). al-Qaadee ‘Iyaad ibn Moosaa al-Yahsibee (d.544H). Aboo Hafs ‘Umar ibn ‘Abdil-Majeed al-Mayaanajee (d. 580H). Muheeyuddeen Yahyaa ibn Sharaf an Nawawee (d.676H). Jalaaluddeen ‘Abdur-Rahmaan ibn Abee Bakar as-Suyootee (d.911H). Zainuddeen ‘Abdur-Raheem ibn al-Husayn al-’Iraaqee (d.806H). Muhammad ibn ‘Abdir-Rahmaan as-Sakhaawee (d.902H). al-Haafiz ibn Hajar al-’Asqalaanee (d.852H). ‘Umar ibn Muhammad al-Baiqoonee (d.1080H). 2. al-mutawatir al-Ma`nawiyy (mutawaatir in meaning) – i.e. the hadith of raising the hands in du`a, which is reported in about a hundred ahadith, all of them stating that He (saws) raised his hands in du’aa, but referring to different occasions -so the mention of each case is not mutawaatir, but the common factor -that He (saws) raised his hands, is. “Nazmul Mutanaathir minal Hadithil Mutawaatir” -Muhammad ibn Ja’far al-Kattaanee. al-mustafid - linguistically, that which has been spread or poured forth; technically, there are three sayings : 1) That it is the same as “al-mash-hur”, 2) It is more particular -both ends of its isnad must be equal, 3) It is more general than “al-mash-hur”. That which has no isnad at all. “mash-hur” to the people of arabic grammar. "mash-hur” to the common people. 1) “al-Maqaasidul Hasanah fee Mashtahara ‘alal Alsinah” -as-Sakhaawee. 2) “Kashful Khafaa wa mazeelul ilbaas fee Mashtahara minal hadith ‘alaa Alsinatin-Naas” -al-’Ajloonee. 3) “Tamyeezut-Tayyib minal Khabeethi feemaa yadurroo ‘alaa Alsinatin Naasi minal hadith” – Ibn ad-Dayba’ ash-Shaybaanee. al-`aziz – linguistically, either “rare” or “strong;” technically, that which is narrated by no less than two narrators at every level, e.g. The hadith “None of you believes until I am more beloved to him than his father, his son and all the people.” [al-Bukhari and Muslim]. It is narrated from the Prophet (saws) by Anas from Qatadah and ‘Abdul-’Aziz ibn Suhayb, and from Qatadah by Shu’bah and Sa`id. al-gharib – linguistically, the singular; technically, the hadith which at some stage is narrated only by a single narrator -either in every stage of the isnad, or at a single point. In the view of al-Haafiz ibn Hajar “al-fard” and “al-gharib” are the same, except that “al-fard” is usually used to refer to “al-fardul mutlaq” (that which is reported by a single Companion), and “al-gharib” to refer to “al-fardun-nisbee” (which occurs later in the isnad). al-gharib al-nisbi (relative or “al-fard un-nisbi”) – that which is narrated by more than one narrator to begin with, then somewhere in the isnad one of its narrators has only one person narrating from him. Its being reported only by a certain thiqah (reliable) narrator. Such as their saying: No reliable person narrates it except so and so. Only a certain person narrates it from another particular person. Such as their saying: Only so and so narrates it from so and so -even though it might have other chains through other narrators. It being only narrated by people of a certain town or land. Such as their saying: It is only narrated by the people of Makkah, or the people of Shaam. It is reported from the people of one land by the people of another particular land. Such as their saying: It is reported only by the people of Basrah from the people of al-Madeenah, etc. gharib in its matan (text) and isnad, i.e. That whose text is reported only by a single narrator. “The Sunnahs which are particular to people of a particular land”, [“as-sunanil-latee tafarrada bikulli sunnah minhaa ahlul baldatin”] -Aboo Daawood. Acceptable (maqbul) -That found to be reported by truthful and acceptable narrators. Its ruling is that it is obligatory to accept and act upon it. Rejected (mardud) -That not found to be reported by truthful and acceptable narrators. Its ruling is that it is not accepted as evidence nor acted upon. -hasan due to support of others. e.g. a hidden gap in the isnad. If any of these five conditions are not fulfilled then the isnad will not be saheeh. The ruling regarding the saheeh hadith: It is obligatory to act upon it according to the consensus of the scholars of hadith and all those whose word is counted from the scholars of usool and fiqh. It is a proof in the sharee’ah and it is not permissible for anyone to leave off acting upon it. The most authentic isnads: In the view of al-Bukhaaree the most authentic isnad is: Maalik from Naafi’ from Ibn ‘Umar. [This isnad is known as “silsilatudh-dhahab” (the chain of gold)]. In the view of Ishaaq ibn Raahawaih and Ahmad the most authentic is: az-Zuhree from Saalim from Ibn ‘Umar. In the view of Ibn al-Madeenee and al-Fallaas it is: Ibn Seereen from ‘Abeedah from ‘Alee. In the view of Ibn Ma’een it is: Al A’amash from Ibraaheem An-Nakha’ee from ‘Alqamah from ‘Abdullaah ibn Mas’ood. In the view of Ibn Abee Shaybah it is: az-Zuhree from ‘Alee Ibn al-Husayn from al-Husayn from ‘Alee. The first book written to include only the saheeh: “Saheehul Bukhaaree” which was followed by “Saheeh Muslim”. The more authentic of the two being “Saheehul Bukhaaree”. Neither al-Bukhaaree nor Muslim tried to gather all of the authentic ahaadeeth in their books: Saheehul Bukhaaree contains 7,275 ahaadeeth including repetitions and about 4,000 without repetitions. Saheeh Muslim contains about 12,000 with repetitions and about 4,000 without. book. And these narrations are of two types: 1) That which is reported with certainty, e.g. he said, he ordered, he mentioned -then that is judged to be saheeh from the person it is narrated from. 2) That reported without certainty, e.g. it is said that, it is reported that (using the passive tense), then that does not carry the automatic ruling of it being saheeh. So it is of lesser level than the hasan li-dhaatihi, therefore if any contradiction occurs the hasan li-dhaatihi is given precedence. The ruling for it: It is acceptable and used as proof. Those ahaadeeth which are given precedence due to outside factors: They are of different types, the most famous being: 1) Those ahaadeeth reported by al-Bukhaaree and Muslim in their “Saheehs”, 2) Those ahaadeeth which are reported by various isnads, all of them free from weakness or hidden defects, 3) Those whose isnads are made up of prominent scholars, e.g. that reported by Imaam Ahmad, from Imaam ash-Shaafi’ee, from Imaam Maalik. So if there is any contradiction, ahaadeeth such as these are given preference. Linguistically -That which is firm. Technically -The acceptable (maqbool) hadith which is not contradicted by anything of a similar type. Most ahaadeeth are of this kind. 1) If it is known that one abrogates the other, then we take and act on the abrogating and leave the abrogated; 2) We give preference to one over the other due to one of the different ways of doing so, and there are more than fifty of them; 3) And if we cannot find any way to prefer one over the other, then we cease acting on either of them until we are able to prefer one. The most famous books on the subject: 1) “Ikhtilaaful Hadith” -Imaam ash-Shaafi’ee. 2) “Ta.weel Mukhtaliful Hadith” -Ibn Qutaybah. 3) "Mushkilul Aathaar” -at-Tahaawee. Linguistically -Removal and conveyance. Technically -Allah’s replacing a former ruling with a later one. Knowledge of it is one of the most important and yet hardest of the branches of knowledge. The most prominent of those well-versed in it was Imaam ash-Shaafi’ee. Imaam Ahmad said: “We did not know the generally applicable from the explained, nor the abrogating hadith from the abrogated until we sat with ash-Shaafi’ee. It is known in one of the following ways: 1) If Allah’s Messenger (saws) clearly states so himself, e.g. the hadith of Buraydah in “Saheeh Muslim”: ((I used to forbid you from visiting the graves, so (now) visit them since they will remind you of the Hereafter.)) 2) By the saying of a Companion, e.g. the saying of Jaabir (ra): “The latter of the two actions from Allah’s Messenger (saws) was to leave wudoo from that touched by fire.” [The 4 Sunan] 3) By knowing the dates of each, e.g. the hadith of Shaddaad ibn Aws: ((The cupper and the one cupped have both broken their fast.)) [Aboo Daawood], which is abrogated by the hadith of Ibn ’Abbaas “that the Prophet (saws) had himself cupped whilst in ihraam and fasting.” [Muslim], since in some narrations of the hadith of Shaddaad there occurs that it was in the time of the conquest of Makkah, and Ibn ‘Abbaas went along with him in the Farewell Hajj. 4) By the evidence of ijmaa’. Ijmaa’ does not itself abrogate anything, but is an evidence that abrogation has taken place. Famous works on the subject: 1) “al-I’tibaar fin-Naasikh wal Mansookh minal Aathaar” -al-Haazimee. 2) “an-Naasikh wal Mansookh” -Imaam Ahmad. 3) “Tajreedul Ahaadeethil Mansookhah” -Ibn Jawzee. -There are many types, but they are mostly due to one of two reasons: 1) Something missing in the isnad, and 2) Narrators being unacceptable. 1) That its weakness is not severe, 2) That it falls under something general already established in the sharee’ah, and 3) That it is not considered to be something established or as having come from the Prophet (saws). Technically That which has one or more narrators, consecutively, deleted from its isnad, i.e. : 1) That all of its isnad is deleted, then it is said, for example: The Prophet (saws) said . . . 2) That all of the isnad is deleted up to the Companion, or up to the Taabi’ee. The ruling for mu’allaq ahaadeeth in the saheehain: If it is stated in definite form: “He said:”, etc. then it is saheeh from that person. If however that is not so, and it is quoted in the form: “It is said:”, etc. then it will not be judged to be saheeh until a connected isnad can be found for it. Ibn Hajar compiled a famous work “Taghleequt-Ta’leeq” wherein he researches and provides isnads for the mu’allaq ahaadeeth of “Saheehul Bukhaaree”. all of them are perfectly acceptable and so it does not matter that we do not know who he is. Therefore there are basically three sayings as regards the ruling of the mursal: 1) da’eef. This is the position of most of the muhaddithoon and many of the scholars of usool and fiqh. They base this upon the fact that we do not know the condition of the missing narrator, since he may not be a Companion. i.e. his shaykhs are not the shaykhs of the first one, in order that they will not both be doing irsaal from the same person, 3) That it agrees with the saying of a Companion, 4) That most scholars give a fatwaa in accordance with the knowledge contained in it. So if these conditions are met, then its acceptability is established. 2) tadleesut-taswiyah: is even more hated and censured, al-Iraaqee saying that it destroys the reliability of the person who has done it deliberately. 3) tadleesush-shuyookh: is hated to a lesser extent than the first since no-one has actually been dropped from the isnad. Reasons for which people practiced tadlees: tadleesul isnad: 1) To shorten the isnad and the number of links between him and the narrator of the text. (‘uluwwul isnad). 2) That he missed something from the shaykh whom he narrates a lot from, so he performs tadlees so that it seems that he heard that from him as well. 3) That the shaykh is a weak narrator. 4) That he lived long thus a lot of others also narrate from him, so there will be nothing special about his narrating from him if he used his usual name. 5) That the shaykh is younger than the one narrating from him. tadleesush-shuyookh: 1) That the shaykh is a weak narrator. 2) That he lived long thus a lot of others also narrate from him, so there will be nothing special about his narrating from him if he used his usual name. 3) That the shaykh is younger than the one narrating from him. 4) That he narrates a great deal from him, and so the narrator does not like that his name should appear so often in his narration’s. The ruling regarding the narrations of a mudallis: Scholars have differed about the acceptability of their narration’s, the two most famous positions being: 1) Their narration’s are all rejected outright, that is even if they clearly state that they heard the narration from the shaykh. [This position is not the dependable one]. 2) The position of differentiation, so that narration in which they clearly state that they heard the narration from the shaykh is accepted. And that narration in which they do not clearly state that (e.g. saying “from so and so”) is not accepted. [This is the dependable position]. How is tadlees discovered? -Either by: 1) The mudallis himself admitting it when asked, or 2) By the statement of a dependable scholar that it has occurred. Famous works on tadlees and the mudallisoon: 1) “at-Tabyeen li.asmaa.il mudalliseen” -al-Khateeb al-Baghdaadee. 2) Two works of al-Khateeb each on a separate type of tadlees. 3) “at-Tabyeen li.asmaa.il mudalliseen” -Burhaanuddeen ibn al-Halabee. 4) “Ta’reef Ahlut Taqdees bimaraatib al Mawsoofeen bit-Tadleees” -al-Haafiz ibn Hajar. -Is that a narrator narrates from a shaykh in whose time he lived, and maybe even met him, but he never heard anything from him, using a wording such as: “he said:”. How is it discovered? -By one of three ways: 1) The statement of scholar(s) that the narrator never met the shaykh or that he did not hear anything from him. Its ruling: It is da’eef since its isnad is disconnected. 1) That the narrator doing it is not a mudallis. 2) That it was possible that the two narrators in question could have met. And according to Muslim these two are sufficient. The three extra conditions are: 1) That it be established that they met, deemed necessary by al-Bukhaaree, Ibn al-Madeenee and others. 2) That they were in each others company for a long period of time, deemed necessary by ‘Abdul Muzaffar as-Sam’aanee. 3) That it is known that he narrated from him, deemed necessary by Aboo ‘Amr ad-Daanee. Its ruling: 1) Ahmad and some scholars say that it is broken until it is shown to be connected. 2) The majority of scholars say that it is the same as for (‘an) and is acceptable with the same conditions. 5) The narrators being unknown (al-jahaalah) – . Linguistically -That brought or put down. Technically -Is a lie, invented and attributed to the Prophet (saws). Its level: It is the worst and most evil of all the weak ahaadeeth. Some scholars place it in a class of its own, not holding it to be a type of weak hadith. The ruling regarding its narration: Scholars have agreed that it is not permissible to narrate it except to explain that it is fabricated. How is it detected? -It is known by various means, from them: 1) The fabricators later admitting it. 2) That which is the same as his admitting it, such as his admitting that his alleged shaykh died before the narrator’s birth. 3) Some outward indication, e.g. that the narrator is a Raafidee and the narration supports his party. 4) Some textual indication, e.g. unbefitting language or a contradiction of the clear text of the Qur.aan. Reasons why people fabricated ahaadeeth: 1) Imagining that they would be rewarded for it, by forging ahaadeeth to warn the people against evil actions and encouraging them to do good. 2) To support their own madhhab. 3) To attack Islaam, done by those who could not attack Islaam from outside. 4) Seeking closeness to rulers, by fabricating ahaadeeth in their favour to please them. 5) Seeking monetary gain. 6) Seeking fame, by narrating ahaadeeth not reported by anyone else. Famous works on fabricated ahaadeeth: 1) “Kitaabul Mawdoo’aat” -Ibn al-Jawzee. 2) “al-Laaleeul Masnoo’ah fil ahaadeethil Mawdoo’ah” -as-Suyootee. 3) “Tanzeehush Sharee’atil Marfoo’ah ‘anil ahaadeethish-shanee’atil mawdoo’ah” -Ibn ‘Iraaq al-Kinaanee. Linguistically -Abandoned, renounced. Technically -That in whose isnad is someone accused of lying. Reasons for accusing a narrator of lying: 1) That the hadith is only reported through him, and it contradicts established principles. 2) That he is known to lie in his everyday speech. 5) "al-’Illal” -ad-Daaraqutnee (which is the largest and most extensive). Linguistically -Something entered into something else. Technically -That whose isnad has a text connected to it incorrectly, or that which has something entered into its text which is not from it. narrator relates an isnad, and then something happens which causes him to say something not connected to the hadith, and some of those who hear it think it to be the text of the hadith and so they report it as such. any separation. 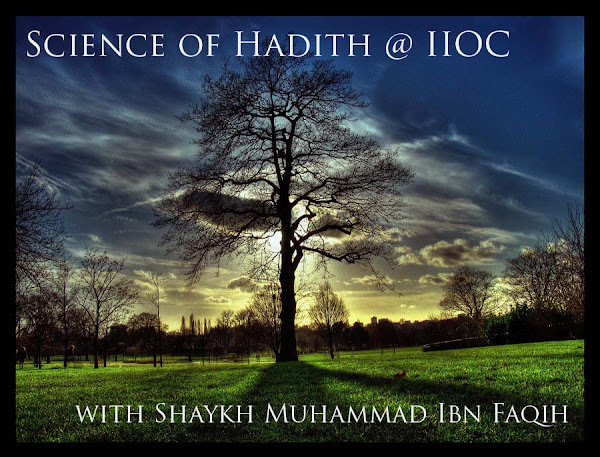 And it is of three types: 1) That the idraaj occurs at the beginning of the hadith (which is rare), e.g. that the narrator makes a statement and then quotes a hadith directly after it to support it, so some of the listeners think it all to be part of the same hadith. 2) That the idraaj occurs in the middle of the text (and this is even rarer), e.g. that a narrator explains a word of the text after quoting it. 3) That the idraaj occurs at the end of the hadith. Causes of idraaj -From them are: 1) Clarification of a ruling. 2) Extraction of a ruling from a hadith before completing its narration. 3) Explanation of the meaning of a word in the text. How is it uncovered? -By various ways, from them: 1) That it is reported elsewhere apart from the text. 2) That scholars declare its state that it is so. 3) That the narrator himself states that it is so. 4) The impossibility of it being from the Prophet’s (saws) saying. The ruling for idraaj: Scholars are agreed that it is forbidden unless it is to explain the meaning of a word, as az-Zuhree used to do. Famous works on idraaj: 1) “al-Faslu lilwaslil Mudraj fin-naql” -al-Khateeb al-Baghdaadee. 2) “Taqreebul Manhaj bi-tarteebil Mudraj” -Ibn Hajar. Technically -Changing the wording for another in the isnad or the text. 1) That the name of a narrator and his father’s is reversed, e.g. instead of “Ka’b ibn Murrah”, he is called “Murrah ibn Ka’b”. 2) That the name of a narrator is replaced by that of a completely different narrator, producing a new isnad. One who does this is described as “stealing hadith”. 1) The order of two words is reversed, e.g. the hadith which Muslim reports from Aboo Hurayrah about the seven who Allah shades on the Day when there is no shade other than that of His Throne, wherein it occurs: “and a man who gives in charity and hides it such that his right hand does not know what his left gives in charity.” This wording being a narrator’s mistake, the correct version being: “such that his left hand does not know what his right gives in charity.” [al-Bukhaaree and Muslim] 2) Giving the text of a hadith the isnad of another and giving its isnad also to a different hadith, done for example as a test, like the people of Baghdaad did to al-Bukhaaree. Reasons for performing iqlaab, from them: a) To produce a new and different isnad, to impress people into narrating from him. b) To test a narrator’s memory and precision. c) It may occur by accident. 1) If it is done for reason (a), then it is forbidden without a doubt, since it involves changing the hadith. 2) If it is done as a test, then it is permissible with the condition that what is correct is explained before the end of the sitting. 3) If it is done by mistake, then the one who did it is to be excused, but if it occurs from him repeatedly then it destroys his precision and he is declared to be weak. As for the hadith which is maqloob: Then it is weak. Famous works about it: 1) “Raafi’ul Irtiyaab fil Maqloob minal Asmaa.i wal Alqaab” -al-Khateeb al-Baghdaadee. Technically -A narrators being added to a connected isnad. Conditions for its rejection: 1) That the one who reports without the addition is more sound than the one who reports it with it. 2) That the addition occurs in a place where it is clearly shown that the narrator heard the original from his shaykh, i.e. in the original isnad he says, for example, “so and so narrated to me:”. If either of these two is absent, then the addition will be preferred and accepted, and the isnad without it will be considered to be disconnected (munqati’), and will in fact be “al-mursalul khafee”. original is to be declared as munqati’. Reply: and this is the case. 2) That if at the point the original definitely states that the narrator heard it from his shaykh, then perhaps he heard it by means of an intermediary, and then later heard it directly. Reply: and although this is possible, scholars do not declare the addition to be a mistake unless they have evidence of that. Famous works about it: 1) “Tamyeezul Mazeed fee Muttasilil Asaaneed” -al-Khateeb. Linguistically -That causing disturbance. Technically -That which is reported in contradictory forms, all of equal strength. Its conditions -It is not declared mudtarib unless two conditions are present: 1) Its narrations disagree and cannot be harmonised, and 2) All of its differing narrations are of equal strength, so that none can be preferred over the others. If harmonisation is possible or preference can be made, then that is done in an acceptable way, then it ceases to be mudtarib. Tirmidhee: “Hood and its sisters have turned my hair white.” ad-Daaraqutnee says of it: “It is mudtarib, since it is not reported except by way of Aboo Ishaaq, and the reporters from him report it in about ten different ways, some reporting it as being mursal, others as being mawsool; some declaring it to be from Aboo Bakar, some from Sa’d and some from ‘Aa.ishah and in other ways. And its narrators are reliable and it is not possible to prefer some over others or to harmonise. From whom does idtiraab occur? : 1) It may occur from a single narrator who reports the hadith in the different ways, or 2) It may occur due to a group of people each narrating something contradictory. The reason for its weakness: This is because it shows that its narrators have not been precise in what they are narrating. Famous works about it: 1) "al-Muqtarib fee bayaanil Mudtarib” -Ibn Hajar. Linguistically -A literary mistake. Technically -Changing a word in a hadith to other than that which is reported by the reliable narrators either in wording or meaning. 2) tas-heef in the matan. 2) Its cause: 1) tas-heeful basar (due to the eye), i.e. due to a misreading. 2) tas-heefus-sam’ (due to the hearing), i.e. due to mishearing. 3) Whether in the meaning or the wording: 1) tas-heef in the wording (lafzee). 2) tas-heef in the meaning (ma’nawee), i.e. that although a narrator reports the wording correctly, he misinterprets it, such as the saying of Aboo Moosaa al-’Anazee: “We are a noble people, the people of ‘Anazah, Allah’s Messenger (saws) prayed in our direction.” He understood this from the hadith that the Prophet (saws) prayed towards “al ’Anazah” which he thought referred to their land. “al-’Anazah” is however a short spear which He (saws) stuck into the ground and prayed towards. The classification of al-Haafiz ibn Hajar -He divided it further into: 1) musahhaf -(due to the dots over the letters), i.e. taking Ta to be Tha or Ba, etc. 2) muharraf -(due to incorrect vowelling). Does tas-heef affect the narrator? : 1) If it rarely occurs from a narrator, then it will not affect his precision. 2) If however it occurs often, then it will destroy his precision and show that he is not acceptable in this field. The reason for a reporters falling into excessive tas-heef: This will be due to his narrating ahaadeeth from books instead of directly from the shaykhs. Famous works about it: 1) “at-Tas-heef” -ad-Daaraqutnee. 2) “Islaah Khata.il Muhadditheen” -al-Khattaabee. 3) “Tas-heefaatul Muhadditheen” -Aboo Ahmad al-Miskaree. Linguistically -ash-shaadhdh is the “odd one out”. Technically -That which is reported by a reliable narrator in contradiction to someone more reliable. Where it occurs: It occurs in the isnad or in the matan. al-mahfooz (that retained/memorised): Is the opposite of the shaadhdh, i.e. that which a more reliable narrator relates in contradiction of a reliable narrator. Their ruling: ash-shaadhdh is da’eef and rejected. al-mahfooz is authentic and acceptable. -a narrators being unknown Technically -That the person or condition of a narrator is unknown. 1) That a narrator has many names, titles or descriptions, so he may be called by a title common to others. 2) That he narrates very little, so that maybe only a single person narrates from him. 3) That his name is not stated, being called “a shaykh”, etc. Example of (1): Muhammad ibn as-Saa.ib ibn Bishr al-Kalbee. Some call him “Muhammad ibn Bishr”, others “Hammaad ibn as-Saa.ib”, some “Abun-Nadr”, some “Aboo Sa’eed” and some “Aboo Hishaam” so he may be thought to be a group of different people. 1) majhoolul ’ayn -: He whose name is mentioned but only one person narrates from him. The ruling regarding his narrations -They are not acceptable unless he is certified reliable. How can he be certified reliable? -By one of two things: 1) That someone other than the narrator from him declares him to be reliable, or 2) That the person narrating from him declares him to be reliable, with the condition that he himself is a critic of narrators. two or more narrate from, but not declared as reliable. The ruling regarding his hadith -In the view of the majority, his narrations are rejected. 3) al-mubham – (“unclear”): That containing a narrator whose name is not stated. Its ruling -It is rejected until he can be identified. Will his narration be accepted if the narrator from him says something like “a reliable man narrated to me.....?” -It will still not be accepted since he may be reliable in the view of the narrator, but not so in the view of others. Famous works on the subject: 1) “Moodihu Awhaamil Jam’i wat-Tafreeq” -al-Khateeb. 2) “al-Wuhdaan” -Imaam Muslim. 3) “al-Asmaa.ul Mubhamah fil Anbaa.il Muhkamah” -al-Khateeb. 4) “al-Mustafaad min Mubhamaatil Matan wal Isnad” -Walee-uddeen al-’Iraaqee. : That which amounts to kufr and takes a person out of Islaam. That which makes a person a faasiq but not a kaafir. 2) That what he narrates does not support his innovation. -Technically -One who is “sayyi.ul-hifz” is the one who is mistaken more than he is correct. Its types: 1) One whose memory was always bad throughout his life. And some scholars of hadith call his narration’s “shaadhdh” 2) One whose memory became weak, either due to old age, his becoming blind or his books being burnt, and he is called “al-mukhtalat”. 1) What he is known to have reported before the “ikhtilaat” is acceptable. 2) What he reported after the “ikhtilaat” is rejected. 3) That which is not known whether it was before or after, then judgement is suspended until it is clear which is the case. Technically -That which the reliable narrator reports in contradiction to what a weak narrator reports; i.e. opposite of the munkar, in the definition of Ibn Hajar. That which has the ruling of being “marfoo’”: Some types of narration have the appearance of the mawqoof but are given the ruling of being marfoo’. For example: 1) The saying of a Companion who is not known for reporting from the People of the Book, a saying which is not possible for it to come from his own deduction, e.g. 2) Information about the future or the unseen. 2) The Companion’s saying: “We used to do so and so in the time of the Prophet (saws).” 3) The Companion’s saying: “We were ordered to do so and so”, “We were forbidden to do so and so”, “From the Sunnah is . . .”. 4) The tafseer of a Companion relating to the reason for revelation of a certain aayah. Usage of ash-Shaafi’ee and at-Tabaraanee -Some muhaddithoon, amongst them ash-Shaafi’ee and at-Tabaraanee, use the term Maqtoo’ to refer to the Munqati’. Linguistically -“Attributed” Technically -That whose isnad is connected back to the Prophet (saws). Linguistically -“Connected”. Technically -That whose isnad is connected whether marfoo’ or mawqoof. A connected isnad back to a taabi’ee is not referred to as being “muttasil” unless restricted, e.g. “muttasil to az-Zuhree”. That which some reliable narrators report in addition to what other reliable narrators narrate from a certain hadith. Scholars famous for devoting themselves to this: Aboo Bakar ‘Abdullaah ibn Muhammad ibn Ziyaad an-Neesaabooree. Aboo Nu’aym al-Jurjaanee. Abul Waleed Hassaan ibn Muhammad al-Qurashee. Where it occurs: 1) In the text -by increase of a word or sentence. 2) In the isnad -by declaring that which is mawqoof to be marfoo’, or that mursal to be muttasil. The ruling of ziyaadah in the text -Scholars have differed about it: 1) Some always accept them, 2) Some always reject them, and 3) Some reject the addition if reported by the same narrator and accept it if reported by someone else. 1) Restriction of the unrestricted, and 2) Particularising the general. And an-Nawawee declares that this is accepted. The ruling for additions in the isnad, i.e. whether an isnad is muttasil or mursal, and whether an isnad is marfoo’ or mawqoof. Scholars differ about this, having four sayings: 1) The ruling is given in favour of the one who declares the isnad to be muttasil or marfoo’ (i.e. acceptance of the addition). 2) That the ruling is given in favour of the one who declares the isnad to be mursal or mawqoof (i.e. rejection of the addition). [This being the saying of the most hadith scholars]. 3) That the ruling is given in favour of the majority. 4) That the ruling is given in favour of the one with better memory. Technically -Gathering the chains of narration of a hadith reported by a narrator to see if others also report it or not. Technically -The hadith whose narrators also narrate that which the original narrator in question reports in wording and meaning, being reported from the same Companion. Technically -The hadith whose narrators also narrate that which the original narrator in question reports in wording and meaning or only in meaning, but from a different Companion. So al-i’tibaar is the process of following up chains of narration of a particular hadith in order to find supports (shawaahid and mutaaba’aat). A different usage of the terms -Some scholars use: at-taabi’ -to mean that supporting narration which has the same wording, whether or not reported from the same Companion, and ash-shaahid -to mean that supporting narration which has the same meaning, whether or not reported from the same Companion. And they may be used interchangeably without any harm since their purpose is one, i.e. supporting the original narration. Linguistically -“Agreement”. Technically -That a narrator agrees to the narration of others in narrating a certain hadith. nswiththe original isnad somewhere in the chain, but not from the hadith. 1) As for the mutaaba’ah taammah, it is what al-Bukhaaree reports from ‘Abdullaah ibn Maslamah al¬Qa’nabee from Maalik with the same isnad and ash-Shaafi’ee’s wording. 2) As for the mutaaba’ah qaasirah, it is what Ibn Khuzaymah reports by way of ‘Aasim ibn Muhammad from his father Muhammad ibn Zayd, from his grandfather ‘Abdullaah ibn ’Umar with ash-Shaafi’ee’s wording. 3) As for the shaahid, it is what an-Nasaa.ee reports by way of Muhammad ibn Hunayn from Ibn ‘Abbaas from the Prophet (saws), with ash-Shaafi’ee’s wording. 1. Get ready for a new class memorization competition! 2. Sh. Faqih is going to get his ijazah from Sh. Walid in 25 ahadith, who’s sanad traces back to the Prophet Muhammad (saws). 3. Sh. Bakr Abu Zaydi (supreme scholar of Saudi Arabia) passed away last week @ the ages of 63. One of his writings was an article (not published) that was sent to one of the shuyukh in Saudi Arabia who had very harshly criticized Sayyid Qutb. In this article/letter, he was defending Sayyid Qutb, and it was amazing. He was also known for his stance regarding anyone that attacked du`a’ and the scholars and issues as such. 4. Dr. Salih al-Salih passed away in the masjid of the Prophet (saws). May Allah (swt) give them both jannah and compensate them with their efforts, and replace the ummah with people who are more knowledgeable than them. 2. Tawatur ma`nawiyy (in meaning) – different versions of the statement, but the meaning is the same. 1. That it be narrated by a large number of people. 2. That this number be found at every level of the isnad. 3. That it is impossible that they could have gathered together upon a lie. 1. Maqbul (accepted) – if this hadith can most likely be attributed to the prophet (saws), then it is accepted and to be applied. 2. Sahih li ghayrihi (authentic by another hadith) – a hadith in this section consists of one weak hadith, and one strong hadith that supports it. 2. Hasan li ghayrihi (sound by another hadith) – the hadith about divorce being the most hated halal act. 2. Mardud (rejected) – if this hadith cannot be attribute to the prophet (saws), then it is rejected. It is not to be accepted as evidence nor is it to be acted upon. It is a hadith that has a chain of narrators that is connected through just and precise narrators from the beginning to the end, not having discrepancies or any hidden defects. 1. ittisal al-Sanad – that is that the isnad is connected; that every one of its narrators heart it directly from the person he is narrating from, from the start of the isnad to the end of it. These conditions are to be applied to everyone except the sahabah because their credibility has been already established by Allah (swt) and Prophet Muhammad (saws). The only thing that will come up with speaking of the sahabah is if they are actually a sahabi or not. 3. DabT – precision; each one of the narrator must be a DabiT (precise). 1. DabT al-Sadr (precision of the heart) – that he memorizes it correctly and transmits it as he heard it and that he understands it if he is reporting its meaning. Scholars check on precision when he receives the hadith and then again when he transmits the hadith. In addition, they compare it against the transmission of someone else. They also look at the narrator’s record – was this person known for their memory? 4. `adam al-Shudhudh (lack of discrepancies) – shudhudh here means when the reliable narrators contradict the words of those who are more reliable than him. 5. `adam al-`Illah (lack of hidden defects) - Non apparent while isnad appears to be solid. ex: hidden gap in the isnad. 2. Must act upon hadith - according to the consensus of the scholars. 1. Both Bukhari and Muslim agreed upon. 2. Only Bukhari agreed upon. 3. Only Muslim agreed upon. 4. Fulfilling the conditions of Bukhari and Muslim but not recorded by them. 5. Fulfilling the conditions of Bukhari but not recorded by him. 6. Fulfilling the conditions of Muslim but not recorded by him. 7. Authenticated by others but not following the conditions of Bukhari and Muslim. Shaykh Ibn `Uthaymin says that 81 of those names are the Qur'an and 18 are from the Sunnah of the Prophet (saws). Jamal Zarabozo has a good article on this specific topic. Gharib (strange) – a hadith that was related by only one person at every tabaqah. Maqbul (accepted) – if this hadith can most likely be attributed to the prophet (saws), then it is accepted. Sahih li ghayrihi (authentic by another hadith) – a hadith in this section consists of one weak hadith, and one strong hadith that supports it. Hasan li ghayrihi (sound by another hadith) – the hadith about divorce being the most hated halal act. Mardud (rejected) – if this hadith cannot be attribute to the prophet (saws), then it is rejected. - Bukhari relates this hadith with two sanads. - This hadith is related with two sanads (chains). One is through four people and the other is with three people. He mentions the shorter one first. The ultimate purpose of Mustalah al-Hadith is to see if a hadith is accepted or not accepted. i. This hadith has many, many narrations at every tabaqah. The tabi`in heard it from the sahabah. The tabi`in related it to their tabi`in. Therefore, this hadith will be narrated by several different people, but their sanad converges back to the same tabaqah of people. ii. The Qur’an has come to us through such a process. The same Qur’an was transferred to a large number of people, which was then transferred to a larger number of people, to a larger number of people. b. Tawatur ma`nawiyy (in meaning) – different versions of the statement, but the meaning is the same. c. Gharib (strange) – a hadith that was related by only one person at every tabaqah. b. Sahih li ghayrihi (authentic by another hadith) – a hadith in this section consists of one weak hadith, and one strong hadith that supports it.